In an amicus (friend of court) brief, Knife Rights Foundation, joined by the Second Amendment Foundation (SAF), had urged the California Supreme Court to affirm the appellate court reversal of Mr. Castillolopez's conviction. Our brief expressed specific concern about the over-criminalization of the carrying of innocent items highly unlikely actually to be used as weapons. Knife Rights Foundation and SAF also argued that a Swiss Army knife was neither historically a stabbing weapon, nor did it fit the definition as one because it lacked an overt locking mechanism that would allow its blade to be locked in place within the meaning of the statute. Castillolopez's attorney, Raymond Mark DiGuiseppe, invited Knife Rights Foundation to participate in the oral argument and the Supreme Court granted the request. At oral argument, Knife Rights Foundation and SAF's attorney asserted that the knife in question contained a simple "slipjoint" mechanism, a feature that is common to Swiss Army-style knives, and that such a mechanism would not allow the knife to be "locked into place" as the California legislature intended when it amended the dirk and dagger statute in the 1990s. Moreover, if the Attorney General were to prevail, then virtually any folding knife would be considered a lockblade knife in California, which defied both common sense and the intent of the legislature. George M. Lee, a partner at Seiler Epstein Ziegler & Applegate LLP, attorneys for Knife Rights Foundation and SAF, said he was gratified by the court's unanimous ruling today. "It's a victory of common sense, and a small step away from the reflexive view that any citizen carrying a pocketknife is also considered to be carrying a deadly weapon, which of course, would be nonsense." Knife Rights Chairman Doug Ritter said, "this was an important case for knife owners because it could have redefined slipjoint knives as lockblade knives, which would have had potentially far-reaching consequences for knife owners in California and elsewhere. We are very pleased that the California Supreme Court declined to be taken-in by the Attorney General's far-fetched arguments." Ritter expressed his appreciation to Second Amendment Foundation for partnering in the amicus brief and to Calguns Foundation and Firearms Policy Coalition for their assistance and support. Ritter also congratulated attorney Guiseppe for his outstanding and extraordinarily well-researched and eloquent defense of Castillolopez and noted, "we were honored to stand beside this passionate defender of a knife owner's civil rights in this critical case." 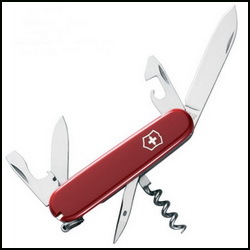 April 14, 2015: A legal brief urging the California Supreme Court to rule that common, non-locking Swiss Army Knives and similar pocketknives are not illegal 'dirks' or 'daggers' was filed on Monday.